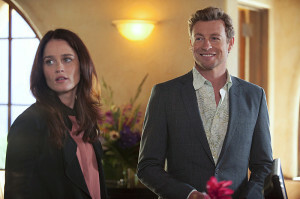 Mentalist Season Finale Photos: "Blue Bird"
The Season 6 finale for The Mentalist airs tonight (May 18) at 10PM on CBS. Here is how they describe it. Before there is any worry: Yes, the show will be back for a Season 7 on the network. Some official photos follow below the description. “Blue Bird” – A new lead in a cold case requires Lisbon to delay her plans to leave for Washington, D.C. with Agent Pike, giving Jane time to finally come to terms with his feelings for her and decide on a course of action., on the sixth season finale of THE MENTALIST, Sunday, May 18 (10:00-11:00 PM, ET/PT) on the CBS Television Network. ÃÂ¢ÃÂÃÂBlue BirdÃÂ¢ÃÂÃÂ ÃÂ¢ÃÂÃÂ A new lead in a cold case requires Lisbon to delay her plans to leave for Washington, D.C. with Agent Pike, giving Jane time to finally come to terms with his feelings for her and decide on a course of action., on the sixth season finale of THE MENTALIST, Sunday, May 18 (10:00-11:00 PM, ET/PT) on the CBS Television Network. Pictured: Robin Tunney as Teresa Lisbon. Photo: Colleen Hayes/Warner Bros. Entertainment Inc. ÃÂÃÂ© 2014 WBEI. All rights reserved.